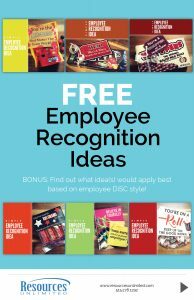 Show your employees you appreciate them! Recognizing your employees creates a sense of well-being, trust, optimism and confidence among employees that will propel company culture forward. Employee recognition is the timely, informal or formal acknowledgement of a person's or team's behaviors, effort or business result that supports the organization's goals and values. Appreciation is a fundamental human need. Employees respond to appreciation expressed through recognition of their good work because it confirms their work is valued. When employees and their work are valued, their satisfaction and productivity rises and they are motivated to maintain or improve their good work!